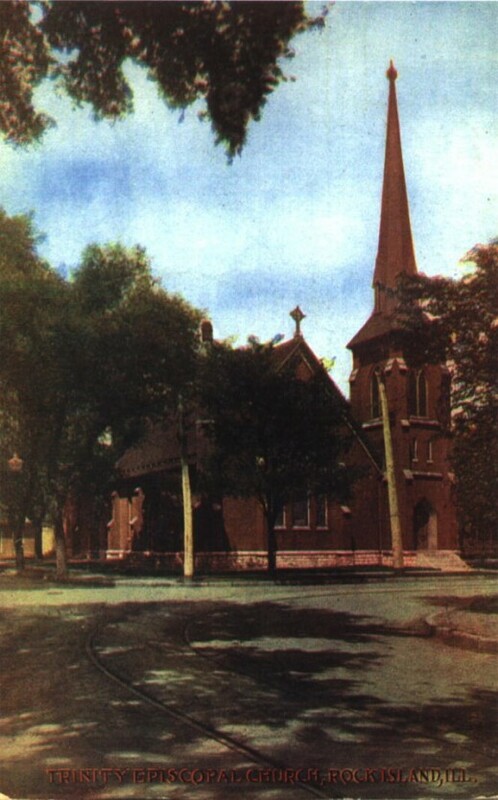 Our early 1900s postcard shows a view of Trinity Episcopal Church as seen from the southeast. It is partly sheltered by trees, with a curving streetcar track in the foreground. This is one of the oldest church buildings in Rock Island that can claim continuous occupancy by the same congregation. Their first church was built in 1857, only four years after the congregation was formed. It was located on 3rd Avenue, then known as Orleans Street, near the west end of today’s City Hall. It was a 2 ½ story building with a Moorish-looking tower extending above the roof. In turn of the century photos, the former church is identified as Turners Hall, one of its subsequent uses. It later became the YWCA headquarters, and was finally razed in the 1930s when the current City Hall was built. Easter services in 1869 marked the opening of this new church on 19th Street at 6th Avenue. It cost $16,000, an exceptionally large amount considering the comparatively small membership at the time. Soon after the church was completed, a rectory was built behind it on 6th Avenue. 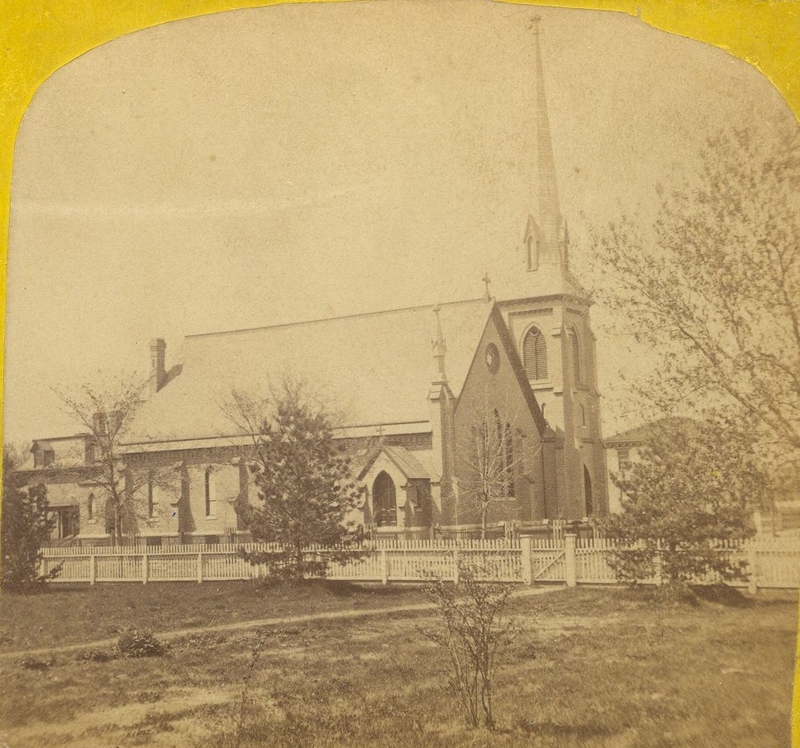 The photo at the right is from a stereoview shortly after the church was completed. 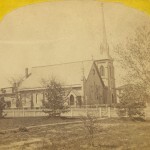 Our 1869 church shows a strong Gothic influence, especially in the windows with their pointed — lancet — arches, the very steeply pitched spire atop the corner steeple, and the small buttresses around the exterior walls. The Gothic architectural style that has its roots in medieval France and England is enduringly popular for church designs. Indeed a lancet-top window is nearly synonymous with ecclesiastical architecture. Notice the smaller steeple on the right, partially hidden by the trees. It was designed to be a well-camouflaged chimney, needed in early years when a stove heated the church. The larger steeple contains the original main entry door. Trinity’s lancet-topped entry doors are always painted bright red, a traditional color for Episcopal churches, as the red color symbolizes the Holy Spirit. The gable peak supports a Celtic cross. Although considered one of the finest churches in western Illinois when built, the interior of the church was originally quite simple – plain plaster walls, beamed gable ceiling, and relatively plain windows. The pews were gated boxes that were individually rented to the parishioners and their families. During its first twenty years, the church was basically unchanged. But as the congregation continued to grow, the building expanded to accommodate it. The first major construction was in the 1890s, when the chancel, the area for clergy and choir behind the altar, was enlarged. At the same time, many outstanding artistic works were contributed to the church. Among these were three stained glass windows, two by John LaFarge and one by Louis C. Tiffany, which were installed in the west end of the new chancel. They were a gift of Mrs. Lucie Castleman in memory of her parents, Mr. & Mrs. P. L. Cable. Somewhat earlier, Mrs. Castleman and her brother Ben Cable had donated a spectacular memorial fountain to downtown’s Spencer Square park. LaFarge is credited with the development of colored opalescent glass, a shimmery, milky, translucent rather than transparent, glass, which was immediately popular for artistic windows. Tiffany was famed for his development of “drapery” glass, a three-dimensional rippled glass that emulated the flow of fabric. Trinity’s St. Cecilia window here contains drapery glass, as well as multiple layers of glass, also a Tiffany trademark. Mrs. Castleman donated extensive carved adornments, much of it oak, including a new altar and reredos (the screen behind the altar). At the time, the altar was termed “the most important piece of carved oak work in the United States.” The ceiling was paneled with wood as well. During the same period, Mrs. Minnie Potter gave a magnificently carved oak pulpit in honor of her deceased husband. It is said that German artisans came to Rock Island specifically to accomplish the carving projects. By 1912 more space needed, so a large parish hall and a smaller chapel were added to the south and west of the original church. The hall was expanded in 1953, and a second story was added as well. Elaborate stained glass memorial windows from England were a 1960s addition to the chapel. The last major construction was in the 1980s when a baptistery was extended from the front of the building where we see the triple window on the postcard. All of the additions have one thing in common – an obvious great effort to ensure that that the original church design was preserved and that details of the newer construction would complement those of the original building. This effort was obviously very successful. Take a trip by the church and notice how all of the additions are lower in height than the original church and how well the newer materials match the original stone and brick. This has been Trinity’s home for 133 years, although the Episcopal affiliation was dropped in 2008 and it became Trinity Anglican Church. We wish the current congregation at least another 133 of caring stewardship – after all, many European churches are older than that and still serve their original function. American buildings, too, can endure. This article by Diane Oestreich, slightly modified, originally appeared in the Moline Dispatch and Rock Island Argus on October 27, 2002.